This EASY and delicious Paleo friendly Balsamic Marinade for Steak is perfect for grilling season! Made with easy to find ingredients that you most likely already have on hand – this marinade will quickly become your go-to. BONUS: Kids love it too! Who is ready to GRILL!? I am so ready for outdoor living and grill season. We (cough, cough … my husband) spent some time this past weekend cleaning our decks, wiping down the outdoor furniture, bringing out the pillows and deep cleaning the grill. Today, I pit-stopped at a store and bought some cute new outdoor plates, cups and other accessories and we are 100% grilling this weekend and I can’t wait! 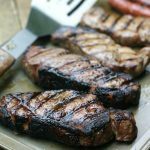 Balsamic Marinated Strip Steaks are on the menu and if you haven’t made this marinade yet, you must print it out ASAP! 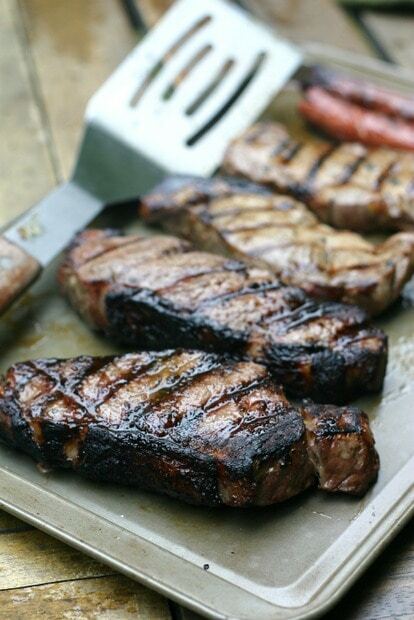 Since strip steak is a leaner cut of beef and pastured beef tends to be less fatty in general, I created a quick marinade that would help tenderize the meat and work really well for caramelizing on the grill. What is so great about this marinade is that it comes together in less than two minutes and doesn’t dramatically change the flavor of the meat – it just adds a slight spice and acid which enhances the natural flavor! NEED IDEAS FOR GRILLED VEGGIES? My Perfect Grilled Broccoli and 3-Ingredient Grilled Asparagus would go perfectly with these steaks! This EASY and delicious Paleo friendly Balsamic Marinade for Steak is perfect for grilling season! Made with easy to find ingredients that you most likely already have on hand - this marinade will quickly become your go-to. Combine all ingredients, except steaks, in a small bowl until mixed well. 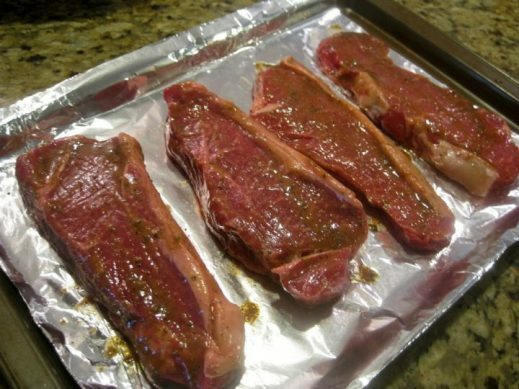 Sprinkle kosher salt and freshly ground black pepper over steaks and evenly cover with marinade. 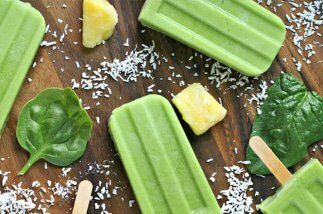 Refrigerate and marinate for at least one hour but no more than 4. Grill and cook according to desired temperature. I use Bobby Flay's method to cook steaks on the grill. The cooking instructions are here. Let rest for 5 minutes, serve and Enjoy! Would there be a negative effect if the steaks marinate over 4 hours? Hi Karen, yes, the acid can break down the tissue to much and change the texture. This is the BEST marinade I have every used for steak! Amazing! 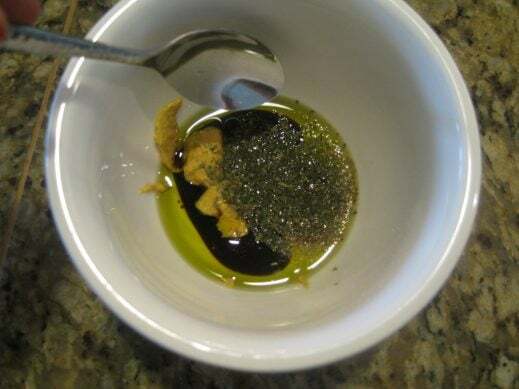 The first time I didn’t have the mustard so just added another tablespoon of balsamic vinegar. Still, amazing. I have used White Raspberry Balsamic as well. Soooo good! As the author states, this marinade does not change the taste of the steak. Just gives them the lift they need to be extra, extra, good. I do not like marinated steak in general. However, I now will use this simple recipe for every steak from now on. THANKS for sharing! All true! Thanks for the great steak tip! I didn’t have spicy mustard, so I used Dijon mustard and added about an eighth of a teaspoon of horseradish to it and it was fabulous. I used it on steak last night and chicken breasts today both were delicious. Thanks for a great recipe. Good call on the addition of horseradish Carol!! Is spicy brown mustard the same as Dijon? 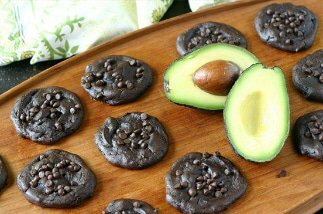 I always try to follow a recipe exactly. 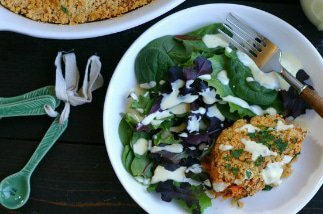 I haven’t made this yet, but I have loved every recipe from this site, especially the spicy baked tofu. It’s not the same. Gulden’s is a popular brand of spicy brown mustard and there are generics like Trader Joe’s and other large grocery stores. It’s really inexpensive! I didn’t have the dijon mustard and just added a little more balsamic and it was still perfect! I used white raspberry balsamic last time and that was super as well. Enjoy! A terrific review, Alyssa, and I’m loving your marinade! I like that it doesn’t interfere with the flavor of the beef, too. Your top photo just looks sooooo good. Yep, my family is really serious about not over doing a steak so I had to keep it light and really as an “enhancer”. We are very seriously about to get 1/4 local, pastured cow but if we don’t or when we run out, I really like the quality (and price) of what Marx has! Love the marinade. Those steaks are cooked to perfection! I have just found your site and am thrilled with the grain fee recipes. I will definitely try this marinade and am very happy you liked our meat. Hi Michelle, Thanks so much and welcome. The New Zealand pastured steaks were truly amazing! 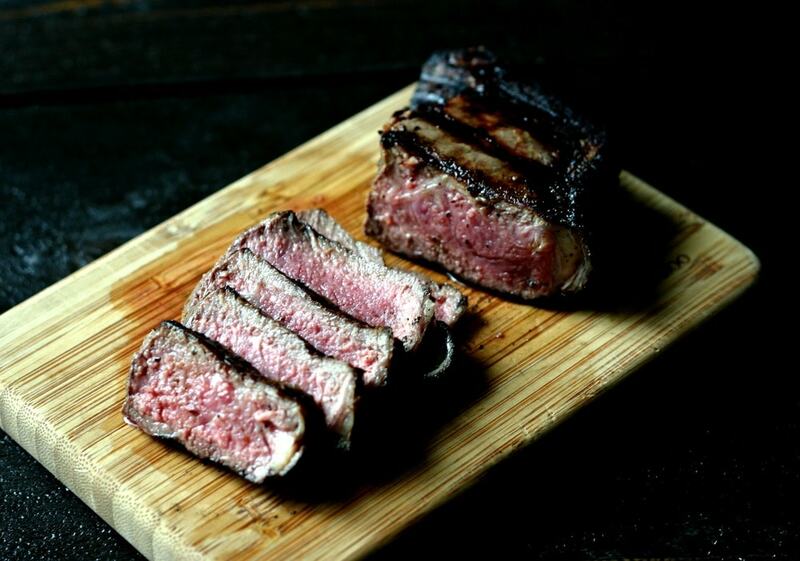 I really like steak but almost never buy it – that cost thing. I hadn’t heard of Marx foods or their steaks – sounds like a good product. And that marinade looks terrific! I’ll definitely make that and use it on a couple of different things. Good stuff – thanks. I love anything with balsamic so this is a perfect marinade! Good to know! Will have to check them out. Marx Foods is a great company! I’ve worked with them before and all their products are really high quality. What a fun taste testing experience! Good to know Joanne – we were very happy with their steaks and their retail store is 5 min from my house so I am thrilled to have another option! Happy Weekend to you to lady – I am wishing we were having these steaks for dinner tonight – soooo good!